A few months ago, I had a really, really tough day in the grocery store. 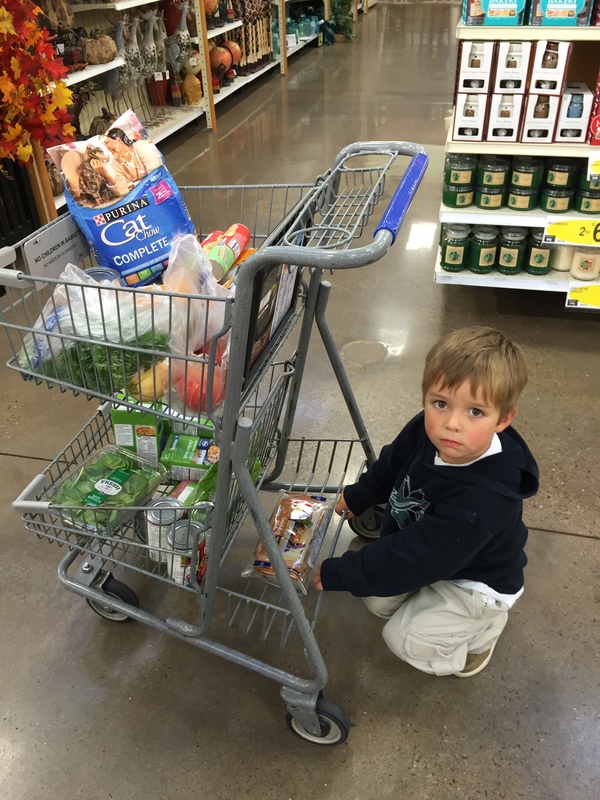 While I was pushing my cart through the five stages of hell (oh, I meant the canned goods aisle), I considered the stages of my grocery store cart development while parenting. The Baby-Carrier-on-Top-of-the-Cart-Handle Stage:This stage is meant to lure unsuspecting parents into thinking, “Hey, I’ve got this parenting thing down. I’m a super-parent. Look! I’m parenting! AND pushing a grocery cart!” Old ladies can’t resist touching the perfect baby in the carrier. Ew. And for some reason, my baby carrier and the shopping cart never quite…clicked. I would see other people’s babies sleeping securely, but I always felt like my mine were four seconds from toppling to their deaths. This phase, however, is relatively benign compared to what comes later. The Shopping Cart Cover Stage:When baby grows out of the baby carrier, you have to put that kid somewhere when you grab a gallon of milk. Some genius, in an attempt to keep germs away from the baby, created the shopping cart cover, a thing that drapes over the top of the cart and has leg holes. In my world, this worked about twice. Then, each child figured out how to unhook the seatbelt and stand or throw loud enough fits for me to set them free. Most of the time, I ended up with the cute shopping cart cover holding the milk and bread, while I held the baby with one arm and clumsily pushed the cart with the other. The Mega-Cart Stage:Once the kids get older, they beg for the fun carts. Whether the mega-cart has an attached car or a huge bench-thing for older kids to sit, driving this monstrosity ensures two certainties. First, you probably should get a CDL. This monstrosity is long and unwieldy…1950’s Cadillacs have a smaller turning radius. I once parked a mega-cart next to my SUV, and it was kind of a toss-up on which was bigger. The second certainty is that the kids will not stay in it. I once had to endure the judgment of many a shopper after my son bailed out of the moving mega-cart in a move more suited for a Hollywood stunt man. The “Push My Own Cart” Stage: On senior citizen day in our huge, visible-from-space grocery store, my kid chose to push his own small cart. For older kids, this could probably work and may even be helpful. My son, however, left behind an unparalleled path of destruction. He wanted to be the leader of our two-cart convoy (his little brother was sitting in the top of my cart…sans cart cover, and teething on the handle, thank you). When the 4yo couldn’t follow directions to the organic goat cheese for the special recipe, I finally convinced him to follow me. He ran over my heels eight times, parked in the middle of aisles, and took out a few old people’s walkers while cutting corners. Also on this banner day, he crashed into one pole of a bright pink breast cancer awareness tent because it “was in his way.” As pink ribbon paraphernalia went flying, I shed a little tear of embarrassment. 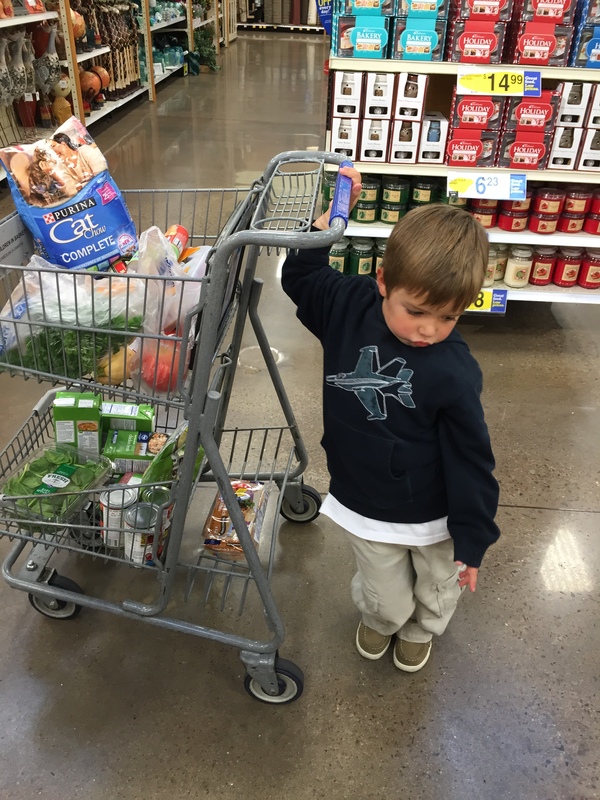 We will not be repeating the “push your own cart” stage anytime soon. The Solo-Grocery-Trip Stage:This is a nirvana that you may never fully appreciate until you’ve had children begging for deli cookies, entering and exiting carts, pausing mid-trip to use the grocery store bathroom, and other assorted fun that you can have while shopping with kids. So, when your spouse says, “I’ll keep the kids here while you get the rest of your groceries,” you should immediately bolt before he changes his mind. I actually left a cartoon smoke trail behind me as I jumped in the SUV and sped away. At my second grocery trip of the day, I popped in my earbuds to listen to a book and perused each aisle at a leisurely pace. I might prefer a solo-grocery trip to a spa day. No matter which cart you’re driving, hustling kids through stores is a parenting rite of passage. Though I enjoyed the serenity of my solo trip, I did miss talking to my little guys about the lobsters in the tank and which cheese they like best and checking the carton for broken eggs. I missed them. A little.